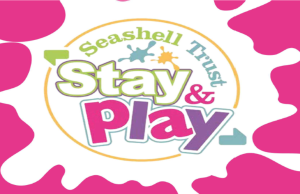 Seashell Trust’s Stay and Play takes place every Wednesday during term time. Drop in between 10.30am and 2.30pm and is for babies and preschool children with complex needs. This includes those with complex physical/medical needs and sensory impairments. Families don’t need to have received a formal diagnosis to join us.Stay and Play is a chance to have fun, support your child’s learning through play and meet other parents and carers. Each week we hold different activities to support your child’s development in areas like communication, early exploration, movement and independence.